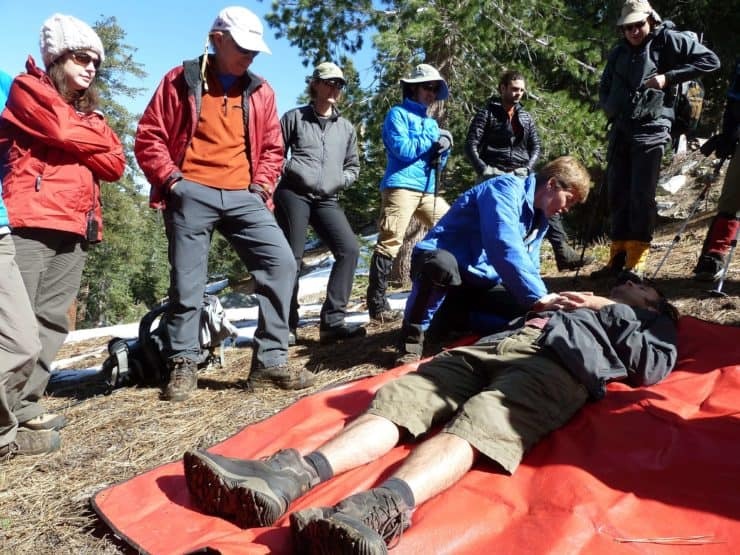 What do you learn at a NOLS Wilderness First Aid class? What can I expect at the class? Building your first aid kit. 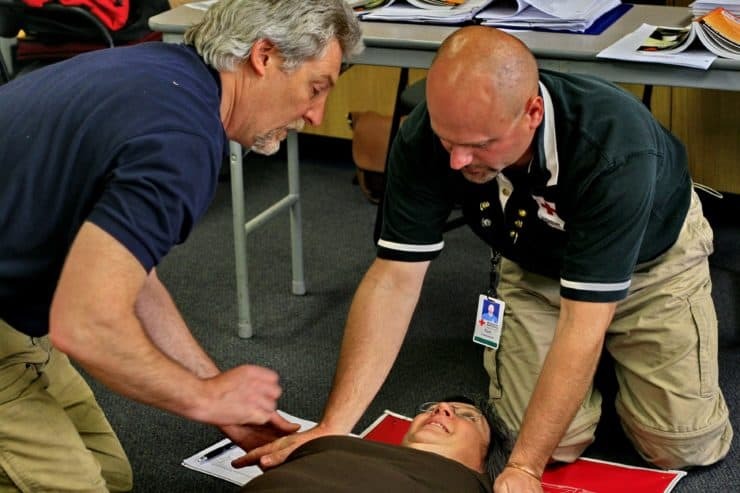 Taking the NOLS wilderness first aid class is one of the best investments you can make. It’ll take a weekend of your time, and in return you’ll learn how to potentially save lives in the wilderness. 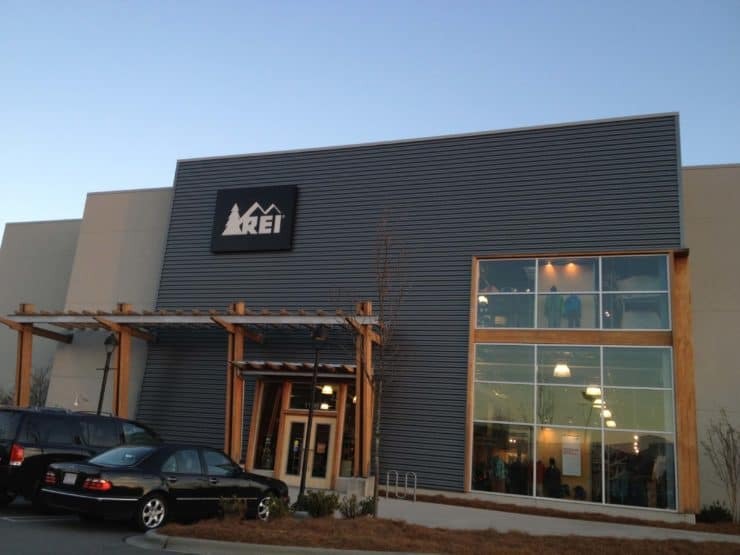 You can take the class at most REI locations. The format is very hands on, and you get to meet and learn with other outdoors folks. I highly recommend the class; here’s what to expect. Why Take a Wilderness First Aid Class? With hiking more popular than ever, there are more and more folks out on the trails. Most of those hikers are well prepared, but unfortunately many are not, and the chances of someone doing something foolish and getting hurt are high. And even for the most prepared hikers, accidents happen. It makes sense to have some wilderness first aid training so that you can potentially help people if you happen to be in a situation where someone needs it. Would you know what to do if you found an injured hiker on the trail? The principles that you learn in the wilderness first aid class work anywhere. So if you’re in your back yard, someone gets hurt, and you’re waiting for first responders, you can help the patient and increase their chances of survival. But more importantly, you’ll learn how to handle emergency situations in the backcountry, when help isn’t close at hand. That’s where the real power of this knowledge lies. What’s the Wilderness First Aid Class Like? The NOLS Wilderness First Aid class I took was two days of class over the weekend, and included an eclectic group of students. Some folks were first responders, there were senior citizens trekking to Machu Picchu, Eagle Scouts, and everything in between, including everyday hikers. We had about 30 students in our class, and two instructors. One of our instructors was an EMT, and the other one was an experienced NOLS instructor. They both knew how to make the material interesting and apply it to real world scenarios. The class was Saturday and Sunday, 9am-6pm, with an hour break for lunch each day, and a shorter 15 minute break in every morning / afternoon block. My class was at the local REI, which had a classroom inside. The course was easy to book through my local REI and I even got an REI member discount for the class. If you don’t live near an REI, NOLS offers classes all over. And at the end of the class, you get Wilderness First Aid certified. When you’re in the front country, you call 911, wait a few minutes, and an emergency situation is handled for you. In the back country, at the very least it will take a few hours for help to arrive, if not days. You have to assume the role of first responder. You are the one who assesses the situation, stabilizes and comforts the patient, and arranges for the rescue. That’s the core of what you learn, how to handle that general scenario. You’re not going to learn how to treat a patient like a doctor would, you’re going to learn how to stop / minimize their harm and get them to medical professionals. The class includes lots of hands-on learning. If you encounter a first aid situation in the backcountry, you can be confident that you’ve run through the situation before. You’ll also get a small laminated cheat sheet to carry in your pack, which will help you remember what you learned. You’ll also learn how to make decisions on evacuating a patient. Sometimes you’ll want to call in a rapid evacuation with a helicopter, and sometimes you’ll recommend the patient walks out themselves. You learn to determine when each option is applicable, and also how to communicate with medical professionals to accurately describe the situation and get their feedback. 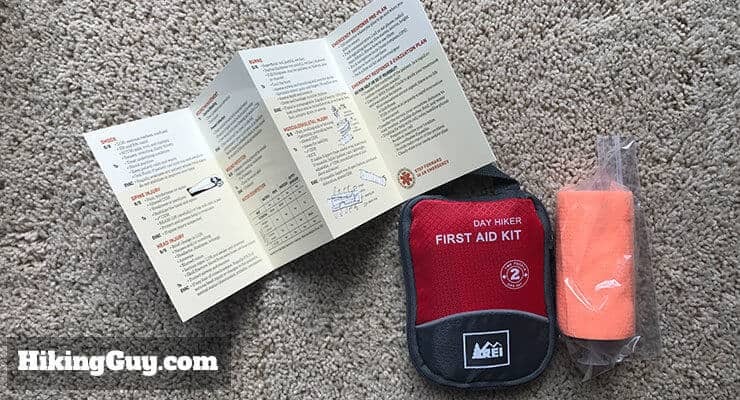 The first thing you dive into is a step-by-step methodology for dealing with wilderness first aid situations, called the Patient Assessment System. The instructors give you a checklist to go through no matter what the situation. We used this checklist for every type of situation we learned about, and after a few times, it became second nature. The instructors even came up with simple a-b-c type mnemonics to help remember the steps. Here’s a NOLS video that goes over the Patient Assessment video. It won’t mean a whole lot to you if you haven’t take the course, but it’ll give you an idea of how the system works, and how thorough it is. My favorite part of the course were the many ‘scenarios’ we ran through. Basically, after you had verbal instruction on a situation, you’d break up into groups with a few classmates and recreate a wilderness first aid situation. Typically one person in the group would be designated the patient, and then given a scenario of what happened. For example, you didn’t take your allergy medicine, you took a shortcut on the trail, blacked out, and woke up lying down. As part of the scenario, the instructors would use makeup to mark your body with the wounds you would have likely received. Showing off my fake wound after playing the patient in a scenario. Then the other part of your group would “find” you, run through the checklist, and try to correctly assess the situation and come up with a course of action. It was not only fun, but helped break up the lecture and reinforced the knowledge. I really learned a lot in these sessions. In addition to the scenarios, we also practiced different techniques in class, such as wrapping bandages, protecting a patient’s spine, etc. Hopefully you carry a first aid kit in your pack, but even with that, there are many situations where you need more. 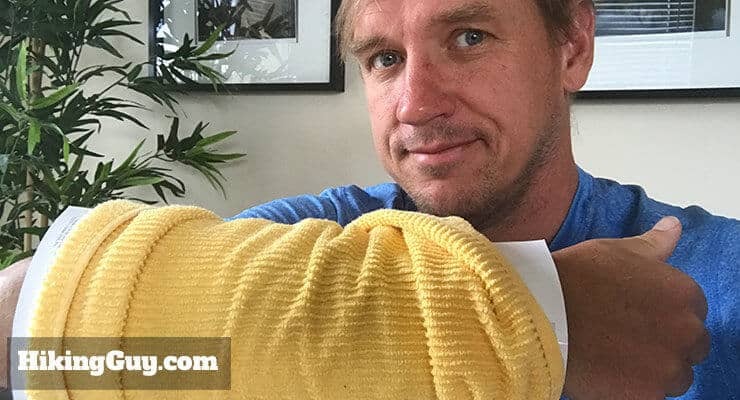 For most situations that we covered, we discussed how to improvise first aid gear when you didn’t have it. I found this part very helpful and enlightening. For example, it’s pretty obvious that you can make a splint out of a stick, but did you know that a rolled up shirt might work better? There were a ton of useful tips like this. Practicing making a splint with an issue of Backpacker and a dish towel (at home). Hikers can not only get hurt from falling or something occurring on the trail, but also from something “normal” like having an unexpected allergic reaction to an energy bar. There’s a lot that could go wrong, and it pays to be prepared. As we went through all the conditions and scenarios, it became evident that the standard first aid kit you buy in the store should probably be modified. The instructors called out good gear to have with you (and what wasn’t so useful), and during the conclusion of the class we went over building a first aid kit. I updated my first aid kit with some other items and the helpful laminated first aid field guide that you get in class. Part of my class included getting certified to use an EpiPen, which allows you to legally purchase and carry one. Helpful when someone goes into an allergic shock. We also received a very handy laminated booklet that summarized the patient assessment system and common conditions. Many students used this during the practice scenarios, and it’s meant to be carried in your pack should the need arise. I knew I wanted to learn these skills, but the idea of a full weekend of classes wasn’t so attractive. I’d rather be outside. But after having taken it, I’m so glad I did. The time goes quickly, and you walk out of the class feeling confident that you can potentially save someone’s life, and for that, it’s 100% worth it. 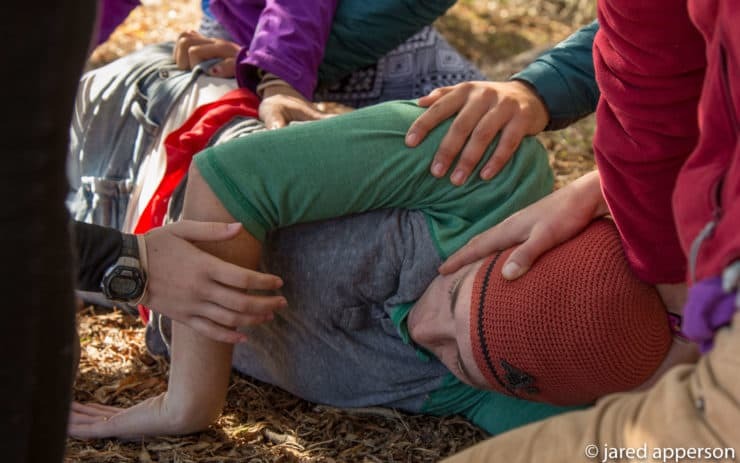 There are a few schools that teach wilderness first aid. I went with the NOLS because they’re a top-level outdoors school. And when I saw that the classes were offered through REI, it was a slam dunk. There are other organizations that teach it too, and I’m sure a Google search will yield results if there isn’t an REI/NOLS option near you. You’re supposed to get Wilderness First Aid re-certified every two years, which seems a bit much for the everyday hiker. If the certification doesn’t mean anything to you (professionally, etc. ), I’d say take the class at least once and maybe do a brush-up course every 5 years.